Anthropology professor Mitch Irwin, who led his first Northern Illinois University study abroad trip to Madagascar this past June, now is planning for a 2014 adventure to the island country off the southeastern coast of Africa. Judging from the experience of students this past summer, he won’t have a problem drumming up interest. But it’s not a trip for the faint of heart. Participants mostly slept in tents on the fringe of a lush rainforest, where they spent each day tracking and studying lemurs. Electricity, plumbing and running water – well, forget about it. Still, for adventure seekers and nature lovers, the payoff is a big one. “I don’t think there are enough words to describe how amazing my experience was,” says Molly Fitzpatrick, a second-year graduate student from Naperville who is studying physical anthropology. Most Americans know of Madagascar from the movie series of animated comedies by the same name, but the real country is rife with dichotomy and tragedy. 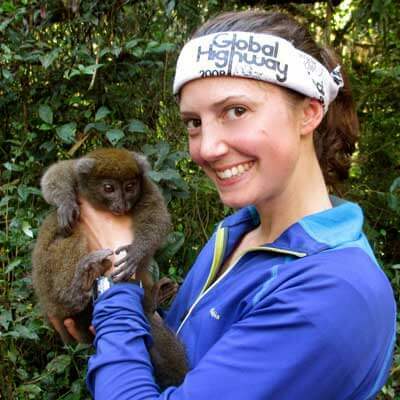 Molly Fitzpatrick with a gray bamboo lemur. It is one of the poorest nations in the world – more than 90 percent of its population lives on less than $2 per day. Yet, in terms of biodiversity, it is one of the very richest. Isolated from other land masses for tens of millions of years, Madagascar is well-known for its spectacular varieties of lemurs, which are found nowhere else in the world. The country also boasts hundreds of species of tropical birds, reptiles and amphibians. However, the rich biodiversity is in danger of being lost. on free-ranging captive lemurs before heading to the forest. Visitors to Madagascar can experience rainforests, deciduous forests and dry desert environments, but all have been impacted by human development. The same is true for lemurs. Because of habitat destruction, these primates are the most endangered mammal group in the world. They are also hunted for food. Joining forces with several dozen primate experts from around the world, Irwin and Samonds contributed recently to a proposed three-year strategy for the conservation of the lemurs of Madagascar. 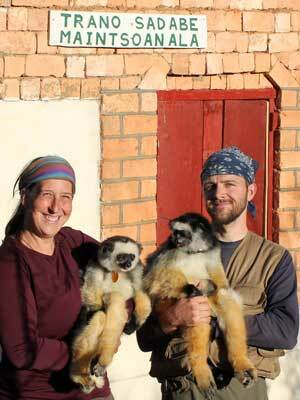 Irwin and Samonds also spearheaded the creation of Sadabe, a non-governmental organization named after a lemur species and based in Tsinjoarivo, Madagascar. The NGO aims to develop innovative ways to promote environmental health and the healthy coexistence of humans and wildlife in the region. Local people have been trained as data collectors, and even have learned English. Through the organization, the NIU scientists also led the month-long, six-credit study abroad program, working with faculty from the University of Massachusetts Amherst and the University of Antananarivo. 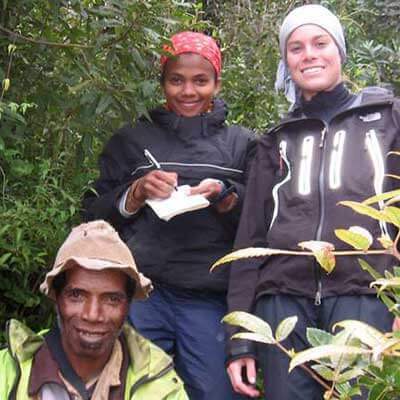 NIU anthropology student Kim Lein will never forget the people of Madagascar. This program included a total 17 students – six registered through NIU, eight through UMass and three Malagasy students. They learned first-hand about primate biodiversity, extinction, forest fragmentation and the challenges of conservation in a third-world nation. The experience was a challenge for Taylor Conter, a senior anthropology major and NIU soccer player from Dexter, Mich. Conter had never before slept in a tent. Experiencing the culture was another highlight for the NIU students. Conter even played soccer with the local guides and Malagasy children. “It was a way for us to all connect and have a fun time after a hard day of work,” Conter says. Senior Taylor Conter (right) enjoyed connecting with the Malagasy people. Each NIU student also conducted a research project. Conter, for example, examined how lemurs reconcile after a fight. Graduate student Molly Fitzpatrick studied bamboo lemurs, which eat bamboo shoots naturally laced with enough cyanide to kill a person. 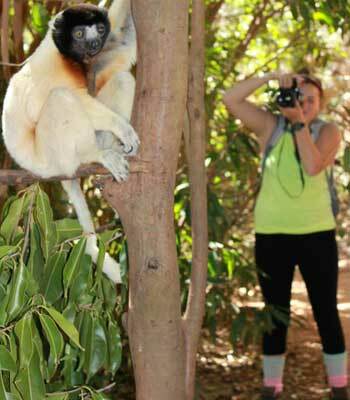 Meanwhile, anthropology major Kim Lein studied scent marking used by lemurs as a means of communication. 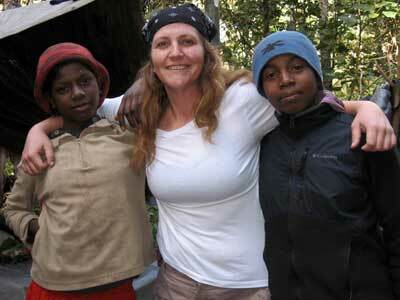 They spent several more weeks trekking even deeper into the rainforest. “Molly and I hiked to the middle of nowhere, built camps from scratch and would study the lemurs from 6:30 in the morning to 4 or 5 in the afternoon,” said Lein, a non-traditional student from McHenry who returned to NIU after raising her son. Students interested in the 2014 study abroad trip to Madagascar, targeted to begin in late May, can contact Mitch Irwin at mirwin@niu.edu for more information. More photos from the 2013 trip are available online.